What will you say of the Lord? Prophetic Message for the year 2014: I will restore! I recently had a conversation with a friend who has been unhappy at her job for quite some time. The pay is low while the amount of work is never ending. As she tries to break out of this uninspiring cycle, she constantly wishes that one day her pay will become commensurate to the amount of work she’s putting into the company. During my conversation with her, I told her that it would never happen. ‘That’s harsh’ she said. ‘Harsh, yes but true.’ I responded. I don’t believe in mediocrity for you and neither does God. Making more money at a job that is uninspiring doesn’t make that job more inspiring. You’re still wasting your potential away. If my friend woke up tomorrow morning and was given a raise, her life would be a little bit more comfortable but she would also become complacent. The fight and fire that she currently possesses to move forward and change her life would instead become a dim light. There’s a reason why you’re currently uncomfortable in your comfort zone. It’s God’s way of telling you that he knows you’ve got more in you. It’s his way of telling you to push forward because there’s more out there in the universe for you. Don’t settle for regular when you can achieve the extraordinary. As the new year progresses, take note of where you currently are. Have you lost that fire to push forward and strive for the best? Are you constantly upset that God isn’t blessing you in a mediocre situation? Trust me, you don’t want more comfort in your comfort zone. Push forward, strive harder, you are not meant to be where you are forever. Your current situation is there to shape, mold and prepare you for where you’re meant to be. It’s simply a stepping stone. 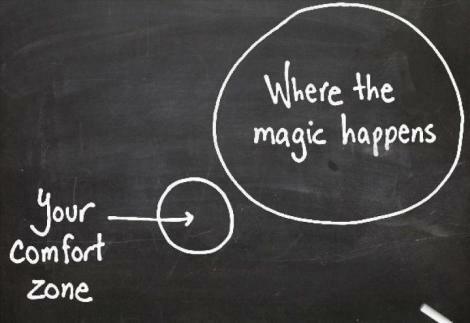 No Comments to "The uncomfortable comfort zone"